Do you love Halloween but the thought of covering your living space in that tacky fake spider web netting causes your skin to crawl? Does the thought of giving up your elegant and comfortable style in lieu of too much orange and black make you cringe? Thankfully, there are other options that don’t include guts and gore in October. Here are six ways to dress up your home this Halloween without sacrificing beauty. Forget orange and black. Updating your Halloween decor game starts with choosing a coordinating color scheme that matches what’s already in your home. For example, if you have tons of navy blue and gold metallic, consider using those as part of your overall seasonal color scheme and add a traditional color like purple or green for extra pizzazz. Use the same series of colors from room to room and even outdoors to create a cohesive look. Gone are the days where celebrating Halloween meant busting out the black light and trying to scare all the little ones in the neighborhood. Instead, consider utilizing soft light to create an eerie but still classy ambiance. Think electronic candles or even actual wax ones. You can even opt for things like vintage-style bulbs, too. Just because it is Halloween doesn’t mean you can’t show off your glam side. Add accent touches to your decor with sparkles, glitter, and even metallic. (Rhinestone Jack-O-Lantern, anyone?) This is a great way to break up the traditionally dark hues of this type of seasonal decor while injecting a bit of your own personal flair. You can even add pops of teal, pink, and white for a look that is still appropriate for the season but quite unique. When decorating for Halloween, it is also important to remain consistent to create a chic style. Try to keep color schemes the same from one area to another and select an overall theme for the home. (Consider design ideas like skulls or vintage mad scientist, etc.) This cohesive style will add extra sophistication and make it easier to create a Pinterest-worthy appeal. Another big seasonal decorating facet to consider is whether to take your decorations more fall or more Halloween. Yes, there is a difference! Fall decor traditional sticks with things like leaves, scarecrows, and pumpkins. Halloween includes more witches, ghosts, and goblins. When deciding on your overall theme for your home, it is usually best to try to stick to one or the other. 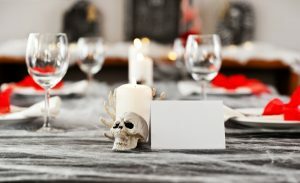 Just because you want a sophisticated look for your space this Halloween doesn’t mean you can’t get a little ghoulish. Consider easy craft projects like spray painting a dozen faux mini skulls the same color and displaying them in a vintage apothecary jar for a chic yet fun aesthetic. Even places like Target, Home Depot, or Pottery Barn offer Halloween decor items that provide a little bit of spookiness without losing style. These are just a few ideas on how to turn boring Halloween decor into something chic and stylish! Do you have any other ideas? Please share in the comments.